What if the church provided leadership training to General Authorities? Now, I realize that there are a lot of different trainers and theories and such out there, but at least one general authority (now emeritus) used to provide that type of training. 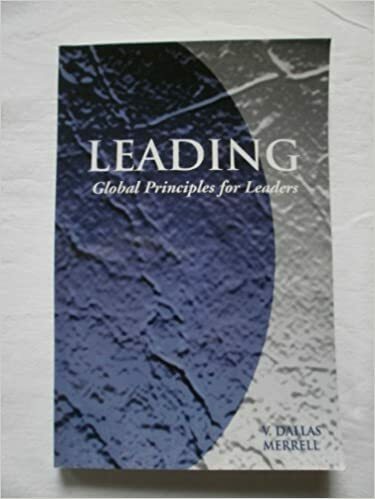 So I picked up a copy of V. Dallas Merrell‘s book (Leading, Global Principles for Leaders) and read it. “Cardinal Francis Stafford heads the Pontifical Counsel for the Laity at the Vatican. It is his responsibility to keep near to the church those who are joining together in interests and devotions that could potentially splinter the church further. That got me wondering just what such a counsel would look like in the LDS Church. The Pontifical Council for the Laity was a unit of the Roman CatholicCuria from 1967 to 2016. It had the responsibility of assisting the Pope in his dealings with the laity in lay ecclesial movements or individually, and their contributions to the Church. Its last Cardinal President from 4 October 2003 to 31 August 2016 was Cardinal Stanisław Ryłko. Its undersecretary from 1967 to 1976 was Professor Rosemary Goldie, the first woman to be the Undersecretary of a Pontifical Council and the highest-ranking woman in the Roman Curia at the time. Another layman, Professor Guzman Carriquiry Lecour, was undersecretary from 1991 to 2011. The Pontifical Council for the Laity had its foundation in Vatican II‘s Decree on the Lay Apostolate. The council was created in January 1967 by Pope Paul VI‘s motu proprioCatholicam Christi Ecclesiam. In December 1976, the council was included as a permanent fixture of the Roman Curia. Its functions were shifted to the new Dicastery for the Laity, Family and Life on 1 September 2016. I know, I’m sidetracked from leadership training in general to a specific that Elder Merrell thought was essential for the health of an organization. This interaction of diverse interests creates a flow of adjustment, of marginal and incremental change. Cooperation within our diversity is the sum product of powerful, caring leadership. The alternative is withdrawal, divisiveness, protests, and chaos. What would leadership training look like to you (not training for the leaders, but training on how to be leaders)? Can you see something like the Pontifical Council for the Laity for the LDS Church? If so, how would it differ, how would it be similar? Do you think we need an interaction of diverse interests as the sum of powerful, caring interests or is that just management speak? How do such things play into whether a group grows or shrinks, whether it succeeds or fails? If President Monson called for leadership training, what do you think he would focus on and who do you think he would call? What training would you like for yourself? For your leaders? Working in a large corporation, we would never give someone the level of responsibility without some significant training. I actually really feel for bishops and them having to learn on the job. The vast majority are deeply good men. I am not sure I get what the “interaction of diverse …” is getting at. But I do know a leader looks beyond just keeping the ward running and thinks about how to make everyone feel they are a part of a great ward. I have had 2 bishops that I think fit that description. Most of the GAs have been higher-level executives and have had quite a bit of leadership training in their careers. Nuts and bolts pragmatic advice — I like that Happy Hubby. I would like our leadership to be trained to listen to the membership. Don’t be dictators. We should have collaboration. Unfortunately, correlation significantly impedes serious consideration of the desires, suggestion, and ideas of the rank and file member. Jesus set the stage for collaboration from very beginning of the restoration. He mandated Common Consent. In addition, whatever training happens, it should not be kept secret. It should be open for the consideration and understanding of all members. I think it is easy to say that people have had successful carreers and therefore do not need any training. I know many successful attorneys who feel that their success means they do not need continuing education. Older doctors feel they don’t need any real additional training and are more likely to kill patients. This is going to sound a little harsh, but the thought of someone in their 90s giving leadership training is just all kinds of wrong for me. Or for that matter someone in their 80s. I love the idea of leadership training based on the best-practices knowledge available today, but I wouldn’t expect my grandfather to have any interest in it, do the research to understand it, or have the ability to teach it. In every relief society and primary presidency I have been in, the stake has regular “training” meetings. Never once has any training happened on how to actually DO the calling, it is typically focused on rolling out the theme. Having spent much of my career doing leadership development, I am always disappointed in lds “training” meetings. I think this is a problem up and down the line, from Q15 to nursery people are left to figure out what is going on and how to function. So much potential wasted in that. EJ — that does point out that perhaps a different focus on more pragmatic training might help. Thanks. Sam, every time I hear “common consent” I tend to hear “majority rule” — is that what you mean? Or do you have a different meaning and application? The only other common use was the pre-exodus Cherokee where it meant anyone could veto. It led to one group besieging the French in a war and another group selling the French supplies. Everyone could opt out of consent. Majority rule I don’t see changing much, other than giving more power to groups like Mormon Women Stand. Everyone can veto anything has other problems. Not that I’m not agreeing that there are things that can be done to integrate and facilitate more, but I’d like to see terms defined. Perhaps you could do a guest post for us on what “common consent” really means and what it doesn’t? And yes, I know I’m putting out a straw man version –it is why I’m inviting him to give us the real story. I have served in multiple bishoprics and in 2 stake presidencies, in the East, South, and Southwest–but not in Utah. The “training” meetings I have been in are platitudes and principles–not much more specific than what you get in a Stake Conference general session. Training on the nuts and bolts, on interpersonal relationships (think Stephen Covey), and on the practical details of using clerks and secretaries effectively are (have been in my experience) essentially non-existent. We stopped doing anything resembling teacher training (remember “Inservice” leaders and classes) 20+ years ago. The breakout sessions for clerks and secretaries at Priesthood Leadership meetings are laughably useless. Fbisti–thank you for that input. Sounds like another post someone should write. I believe one of the issues with “training” in the church is that often those presiding over the training have not actually done the calling(s) they are training people in. Thus they don’t know the nuts and bolts or how-to do the calling, and thus the training becomes merely theoretical. If something was built by professionals to aid in training, especially for leaders who have a wide variety of experience and skills, and somehow there was a way to roll it out consistently enough that all new and standing leaders are able to receive it, everyone would benefit. With technology today, this is totally feasible. Have social workers create a few, mental health professionals a few, management professionals a few (in hopes of how to delegate, stop micromanaging, compromise, time management, run councils for real etc), diversity training, and even receiving revelation ,etc with so many options for topics. EJ– I still remember a talk by someone who was in a presidency who had never been in the auxiliary. She managed to alienate her entire audience without realizing it. Training is good, but I don’t think the answer is in another correlated Church-wide program. We already have a culture of lionizing the Successful Mormon Businessman™ to the point of it being a trope. I don’t want to sit through another meeting peppered with corporate buzzwords and Franklin Coveyisms.